On Monday night I got back from a 5 day trip to visit family back in Ontario. My dad – who never used to cook anything other than fried eggs, potato pancakes or kugelis (a Lithuanian potato dish), has been making the meals for the past couple of years since my mom has been unable to. While he does try his best, his meals often resort to a few frozen pizzas and a can or two of Chef Boy….oh boy. Whenever I visit, I not only bring along some home-baked treats, but I gladly make all the meals from scratch while I’m there. My dad is not a cook and I’m so happy to help out while I’m there. I know that home cooked meals from scratch are always appreciated. This tomato and pasta dish came about when I spotted 5 beautiful beefsteak tomatoes sitting on my parent’s sunny kitchen window ledge. Inspiration struck and within a few minutes, I was slicing the tomatoes up ready for roasting. I didn’t think much beyond that but figured some pasta would be a good match. Unfortunately, there wasn’t any pasta, and while I could have made due with what I could find, my brother volunteered to go to the store. It’s nice to have a handy younger brother who doesn’t mind running errands! While rooting through the cupboards, I did spot some saltines-minus-the-salt in the pantry. Perfect! I crushed them to oblivion and made a little crumble topping with the help of the cheese and some melted butter. Scattering over the bubbling red hot mess, it reminded me of a roasted tomato crumble! This dish was happily gobbled up by both my brother and my dad ( you can see their animated hands in the top photo). The taste was fresh and way better than anything that comes out of a bottle or a can. It was a simple meal to remind them that great doesn’t have to mean a lot of fancy ingredients or complicated directions. 1. Preheat oven to 350. Lay the tomatoes in a large baking dish and sprinkle the olive oil, salt and pepper, thyme and garlic over top. Gently smoosh things around so that everything gets evenly coated. Bake for 1 hour, turning the tomatoes over at the midway point. 2. Meanwhile cook pasta according to package directions. 3. In a small bowl, combine the cheese and cracker crumbs and stir in the melted butter until a crumble forms. Scatter this mixture over the tomatoes and bake for another 15-20 minutes until the topping turns golden brown. 4. Remove tomatoes from oven. 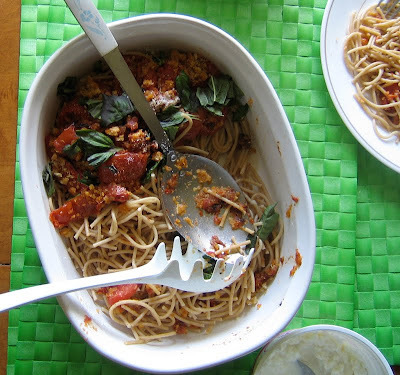 Drain spaghetti and place in a casserole dish, spooning the roasted tomato mixture over top. Tear fresh basil over the dish and serve. This sounds delicious and homey, perfect for these cool evenings we've been having in Ontario. I do hope you enjoyed your trip! Just curious…how did you take that shot? Did you climb on a chair? I love simple pasta dishes with just 3 or 4 ingredients…this is a dish I would enjoy even the next day or so as leftovers! I so admire how you can pull thing together with simple ingredients and a little imagination. I hope it was a good trip for you! 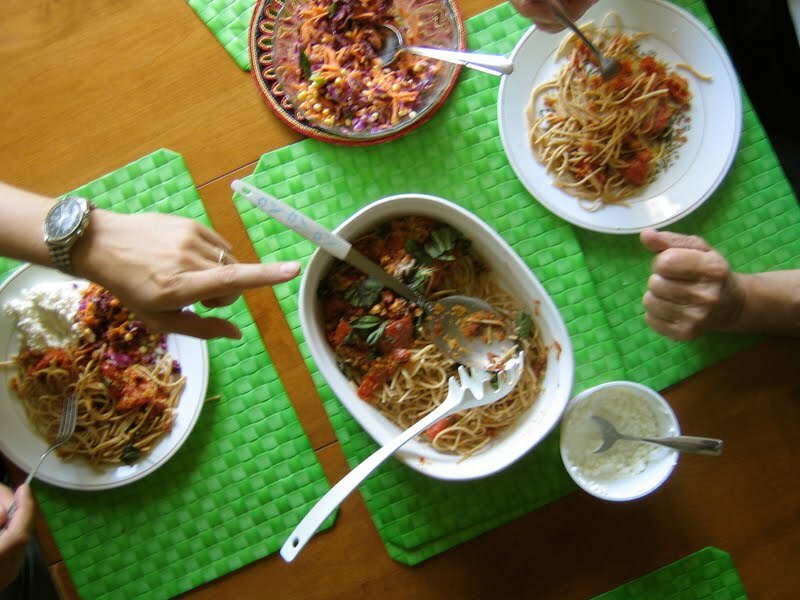 Love the top photo with the hands and the bright green placemats. Really interesting & different from your usual shots. 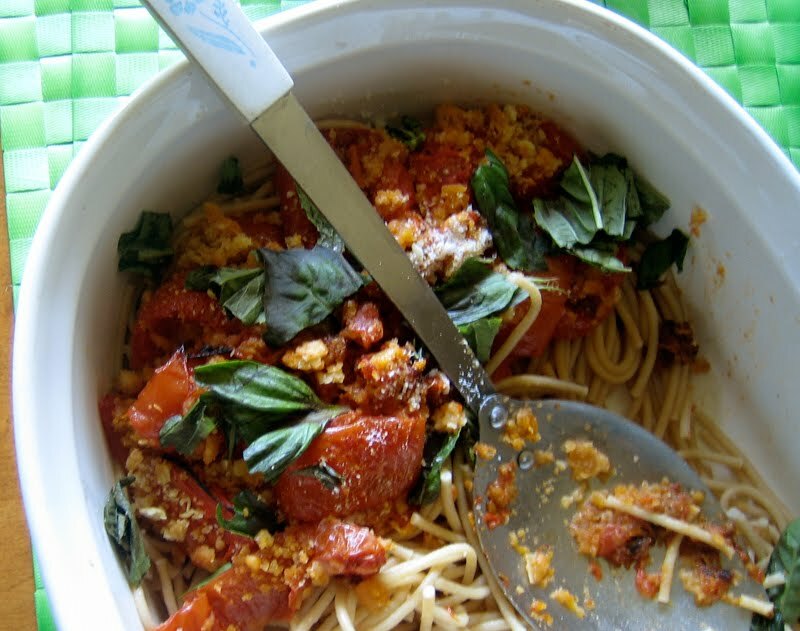 Roasted tomatoes give the perfect homestyle touch to this pasta dish, which is certainly a great one for you guys to share. I'm sure they were thrilled to have you around! This sounds and looks absolutely awesome. I would love to eat this for dinner tonight! Love that top photo with the hands. Thanks Maija. It's different because there are willing hands and lots of light! Oh one day I will have a kitchen with a window!! Bijoux, normally I do get up on a chair to take a photo, but this time I just reached up. There was enough light so it worked out pretty well. Glad I could help, beentsy! Thanks Joanne, very homestyle and very loved. Thanks eatme! It was a perfect dinner feast. this looks so delicious, and i like those green woven place mats.